During our visit to Paris, we stayed in the 18th arrondissement of Montmartre, which is also home to the Sacré-Cœur. The colourful, hilltop neighbourhood of Montmartre, which enthrones the rest of Paris from atop of a tremendous hill, is known to be the artistic and bohemian district of the French capital. The cobbled, steep streets and alleyways are lined with boulangeries, cafes and independent shops that are frequented by locals as well as a tourist crowd. 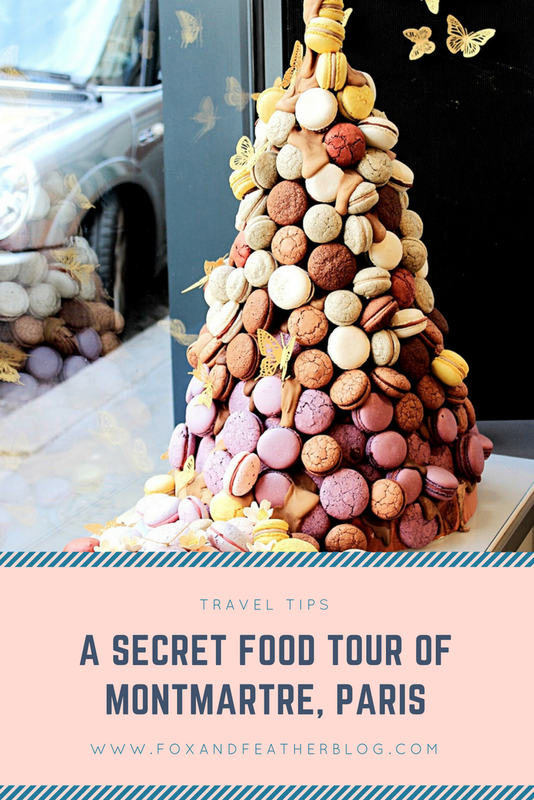 When initially searching for some more 'alternative' things to do in Paris, I chanced across Secret Food Tours, who offer specialised food tours across the world but are actually based in Montmartre, Paris. It's a well-known fact that I bloody love food and having never been on a 'food tour' before during my travels, I was keen to discover French cuisine and the local Montmartre food scene. On the Saturday morning we met our tour group outside of Abbesses metro station and we quickly spotted our tour guide, Emma, thanks to her huge orange umbrella with 'Secret Food Tours' splashed across the top of it. Upon arriving we all introduced ourselves and got to know the rest of our group for the afternoon. There was only a total of 10 of us in the tour, which made it an intimate and more personal experience. After all of our group had arrived, Emma took us through a brief history of the Montmartre neighbourhood and how it had grown into the desirable, trendy area it is today. Before our tour began, we stopped off to see the Le mur de je t'aime - the 'I love you' wall - which is a meeting space where love comes together in over 300 different languages. Fédéric Baron and Claire Kito created the mural in 2000, and it has the phrase 'I love you' written across it over 1000 times in languages from across the world. A wall, which is usually a symbol of division, has been turned into a piece of artwork that is meant to unite with love - how sweet! The outline of the food tour is to shop like a Parisian, avoiding all the chains stores and supermarkets, by stopping off at some hidden, award-winning caterers and then sample the selection of foods we pick up at the end in a little bar down the road. The tour price includes all of the food and wine you taste throughout the 3 to 3 and a half hours, and believe me when I say that you certainly get a lot of food! Our first food stop on the tour happened to be a local butcher, but as James and myself were the token vegetarians on the tour we decided to stay outside for this particular stop, which wasn't an issue. Emma picked up some cured hams and mystery meats for the rest of the group to try a little later on during the tour. Whilst the tour can be adapted for vegetarians, it's noted on the website that they do not cater for vegans. The next stop however was the one I was looking forward to the most - the cheese shop! We journeyed towards the quaint little cheese haven, La Butte Fromagère (32 Rue des Abbesses, 75018 Paris), where we gazed longingly at the cheeses beneath the glass cases and sampled some creamy "Tome Caussonard" - a sheep's milk cheese from the Pyrénées. It was deliciously creamy and that sample had my stomach ready to consume a whole lot more cheese! Emma then told us a little more about the process of creating cheese in France and the fact there are thousands of different cheese combinations in shops across Paris, so it would be a 'tough' job sampling them all. If I lived in Paris, then I'm certain I would try my best to sample each and every one. Our next stop was Chocolat Illèné (2-4 Rue Tholozé, 75018 Paris, France), a chocolatiers that blends a fusion of French sweet treats with Korean tastes. The chocolate shop is owned by two friends, Hyunsoo and Jin, with a Korean background who ditched their careers in chemistry and immunology to pursue their dream of opening a chocolate and pastry shop in France. The front of the store showcases an awe-inspiring tower of colourful macarons in the window that could pass as an extraordinary piece of art on its own. Inside we browsed the incredible collection of macarons and chocolates before selecting a few to taste and takeaway. The chocolates were so good that James and I have promised ourselves that we'll re-visit next time we're in Paris! Our next stop on the tour was Boulangerie Alexine (40 Rue Lepic, 75018 Paris) to pick up a few baguettes to accompany our meal. Emma also picked up a cheese & tomato tart and a cheese & leek quiche for James and me as we wouldn't be eating the meat. This little touch meant we didn't miss out on food when everyone else was sampling the meats during the tasting at the end of the tour. With all of our freshly bought produce we headed to a small little bar where there was some reserved seating for us to set up and begin tasting the food we'd picked up. We tasted six more cheeses, including the strongest and smelliest cheese I've ever encountered (it wasn't actually that bad, but it smelt like a barn!). We spent around two hours or so tasting a heck of a lot of food paired with a fair amount of wine until the point that all of us were clutching our well-tended to stomaches and moaning about how we couldn't possibly eat anything else... well, that was until Emma surprised us with traditional sweet crêpes from the shop next door. Somehow, I found the room in the pit of my stomach to devour an entire crêpe with a Lotus Biscoff spread. Throughout the tasting Emma guided us with tips on how to taste and how to shop for certain foods and wines whilst in Paris. We actually took away some tips on how to shop for better quality wines and practiced them throughout the rest of our trip. Of course I'm not going to share these secrets because for that you'll have to book yourself onto a tour! The Secret Food Tour was something a little different from the usual tourist activities that you would usually partake in when visiting a new city and if you're someone travelling to experience and learn a little more about the French cuisine whilst in Paris, then I highly recommend booking with Secret Food Tours. Prices start at 89€ per person and run 7 days a week, but due to the small tour groups they do get booked up fast! For more information regarding booking and dates, click here. Disclaimer: Secret Food Tours offered us complimentary tours in exchange for an honest review. Everything really was that delicious! Wow those Macarons!! Amazing! I'd love to do something like this, it sounds like a great tour. This sounds like such a fun experience and a great alternative to the usual sightseeing tours. I love the sound of Chocolat Illèné it sounds so unique with the fusion combination. The whole tour sounds so different and must have been a great new way to explore Paris. Wow, what an amazing tour. I love Paris and Montmartre in particular and would love to do this. Paris is also famous for their food, I just love these food and some of these which I ate but It is totally different to get from there. You can visit on gold crest to book your holidays package to celebrate disneyland paris new years eve.